I love the #BookADayUK trend happening through June on Twitter, and I thought it would be fun to share my 30 books with a little tour of some of my shelves. I’d love to hear your 30, too! Links are to Goodreads. They are not affiliate links. If you want to buy these books, please look for them in a local, independent bookstore! Keep printed books alive. Day 1— Favorite book from childhood: Number the Stars by Lois Lowry was my favorite book growing up. Lord knows how many times I read it. I haven’t read it for years, though. I’m afraid I won’t like it as much as an adult. Most of my books are sorted by color. These are my young-reader and chick-lit books. Day 2—Best bargain: After reading somewhere that Lorna Doone: A Romance of Exmoor was voted the favorite novel among men at Yale (in 1906), I had to check it out. But I couldn’t find a copy anywhere, so I started reading the e-book. I loved it right away. A few weeks later, I stumbled across a GORGEOUS copy in an old book store. It’s a 1912 edition, and it’s seriously drool-worthy. I bought it for $7. Here’s a picture of the inside. The outside is shown on #10. Day 3—A book with a blue cover: I organize my books by color, so I have a lot to choose from, but this book of Irish Fairy Tales is my favorite hue. Day 4—Least favorite book by favorite author: I was a hard-core Lord of the Rings fan in high school (yes, I even taught myself some elvish), but I still can’t finish The Simarillion. This is why, though I love some fantasy novels, I don’t love the genre. Too much world building and exposition for me. But give me a fantasy with great characters and action (LOTR, The Two Towers, esp.) or a fantastic voice (C.S. Lewis, Princess Bride, most Neil Gaiman works), and I’ll drink it up. Day 5 —Doesn’t belong to me: I stole this collection of Anne of Green Gables from my mom. Still haven’t read them…But I will! Also, that copy of A Wrinkle in Time has my 5th grade teacher’s name in it. I saw her several years later, mentioned that I found it in my house, but she told me to keep it. I don’t remember stealing it or even borrowing it! But it’s mine now, anyway. Day 6—Books I always give as gifts: I generally give gift cards to book stores instead, but I’, always recommending The Power of One to everyone as well as The Dreamer. Fun Fact? This is Volume 3 of The Dreamer graphic novel, which I copyedited! I’ve been a fan of Lora Innes for several years, so it was awesome working with her. You can read pages of her historical fantasy / YA romance online. Day 8—More than one copy: My husband and I have multiple copies of Tolkien and C.S. Lewis books. My original set of LOTR has fallen apart, I think he gave his away, we have several different illustrated versions of The Hobbit, and we both have several of Lewis’ religious books, which are spread all over the house. Day 9—Book with a movie-tie in. I can’t even remember how I found Stardust so many years ago. I think it was shelved by The Princess Bride as a new release. By the time the movie had come out, I had read it several times. I really should get the hardcover edition, but I keep buying new books! The Hunger Games I had heard of, of course, but I didn’t read it until a few weeks before I saw the movie. In both cases, the books are certainly better. Same for The Princess Bride. The dictionary page hedgehog was a Valentine’s Day gift from my husband. Day 10—Reminds me of someone I love: Tuck Everlasting reminds me of my childhood friend’s mother, who was a second mom to me. I’m not sure why I associate it with her, but I remember seeing it in her house. She probably gave me this copy. Hopefully she didn’t lend it to me, because here it is, on my shelf, a hundred years later. Day 11—Secondhand book shop gem: Probably 75% of my books were purchased secondhand. But this book is the one I bought most recently, and it’s a serious gem. The illustrations and photos will transport you to 1950s suburbia, and I love it. It’s also my favorite color. (This photo shows the detail, but not quite the right color. See #14 for a better representation. This book is the background. Day 12—Pretend to have read it: I skimmed through most of the books I was assigned in school, reading only enough to write killer papers on them. The skimming is why I ended up creating a new major. I was able to pick the books I wanted to read after finishing all the required classes. Day 13—Makes me laugh: You know how some people have an ugly cry? The Georgia Nicolson books make me ugly laugh, even ten years later. Day 14—An old favorite: The Giver. I didn’t realize until college (maybe after!) that my two favorite books growing up were both written by Lois Lowry. I never paid much attention to authors’ names as a kid. Day 15—favorite fictional father: I’m pretty sure everyone has had the same answer, but Atticus in To Kill A Mockingbird. I mean, come on. He’s AWESOME. The painting was done by my great grandmother. Day 17—Future classic: The Ocean at the End of the Lane. It really is everything it’s cracked up to be. This is Neil Gaiman’s unexpected masterpiece. Day 18—Bought on recommendation: I don’t really buy books on recommendation; I borrow them. I buy books that I’ve either read and enjoyed or that are really nice to look at. But I picked up Angus, Thongs, and Full Frontal Snogging (see #13) after reading an excerpt from Book 2 in a magazine. Does that count? Day 19—Can’t stop talking about it: Beautiful Ruins by Jess Walter. Day 20—Favorite cover: Besides many of the books mentioned above, I have to include this hardcover Robin Hood. Because it’s Robin Hood. And it’s illustrated. Check out some of the interior illustrations here. Day 21—Summer read: If you haven’t yet read The Importance of Being Earnest by Oscar Wilde, go read it. I know that plays are meant to be performed, not read, but I love reading plays and screenplays. TIOBE is my favorite play. Other favorites include George Bernard Shaw’s Pygmalion (on which My Fair Lady is based) and Shakespeare’s comedies. If you aren’t into plays, see #19 as my recommendation for summer reading. #13 for guilty pleasure reading. Poetry: Billy Collins or Li-Young Lee are great for summer. Both really approachable poets. Day 22—Out of print: Okay, this is where I get ridiculously nerdy. I picked this book up from the library when I was trying to find a resource on medieval hunting. I don’t like hunting, mind. But this book was so unbelievably interesting, I found myself ignoring the novels on my bedside table to read through this. After a couple of chapters, I wanted to write fan mail to John Cummins. (I honestly tried. Couldn’t find contact information). I never thought I could turn into a medieval hunting fangirl, but there you go. Granted, I picked this book up for research. If you are even remotely interested in Old English or the different breeds of dogs used for different purposes in medieval hunting, then you’ve got to find a copy. Day 23–Made to read at school: I’m going to be honest, most of the books I was assigned to read in school, I didn’t read. By my sophomore year in college, I realized that perhaps I shouldn’t be a literature major after all. But of all the books I was assigned, I’ve loved a few, and I have copies of most of those. The Power of One (#6), To Kill a Mockingbird (#15), Sophie’s World (#26), The Outsiders, and Elie Wiesel’s Night were my favorites from high school. The Things They Carried I was assigned to read in college, but only the first chapter, in its original form as a short story. I loved the short story so much (I love LOTS of short stories), I bought the book and read it instead of reading all the other required lit books, like #12. I don’t read dramas usually. 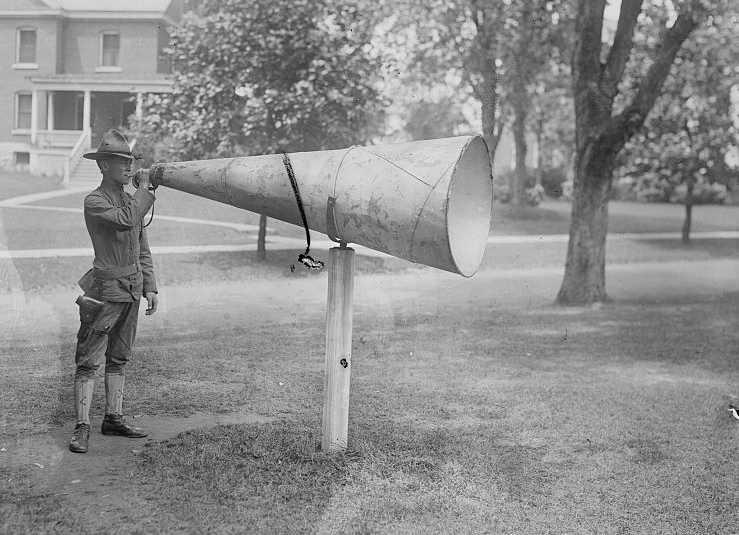 When I do, they are about the horrors of war, and the voice is what keeps me reading. Day 24—Hooked me into reading: I was always a reader. I entered into preschool as a silent reader. I can’t remember a particular book that I read over and over again, but I read A Midsummer Night’s Dream when I was ten, and I wrote & acted in an adaptation of it that year. Shakespeare is what/who got me into theater and, consequently, writing. If you think it’s impressive that I read unabridged Shakespeare as an elementary schooler, know that I hit my peak at about 12. Now anything above a 9th-grade reading level makes me go cross-eyed. I like to blame the internet. Day 25—Never finished: Pride & Prejudice. I know. While I liked it, and I thought it witty, I couldn’t get through it. I plan on picking it up again, someday. It’s still on my shelf. I’ve started at least three Jane Austen novels, and I’ve never finished one. Again, I blame the internet. My attention level is as bad as my preschooler’s. When my kids are in school, and I have more than 15 minutes a week to read, then I’ll start up with the classics again. Day 26—Should have sold more copies: Sophie’s World. This was the textbook for my high school world philosophy class. It’s a novel. Buy a copy. Day 27—Want to be one of the characters: I’ve already mentioned The Princess Bride a few times in this list, but I thought I’d put it here. Because though I read to escape, I don’t think I’d actually want to be any of the characters. I wouldn’t want to go to Hogwarts when Voldemort is out to kill one of my classmates. But if I can be Inigo Montoya, then I want to be Inigo Montoya. Day 28—Bought at favorite independent bookstore: I adore The Book House. I got English as She is Spoke there. Mark Twain loves this book, and so do I. Day 29—Reread the most often: Probably Number the Stars. Otherwise The Lord of the Rings. Or The Dreamer. I don’t reread books very often. I tend to skip to my favorite parts and read those over and over again. Day 30—Would save if house burned down: I used to have an autographed copy of The Outsiders, but I gave it to a friend on her wedding. 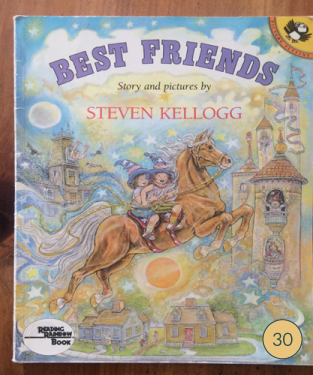 I’d probably save my annotated copy of The Princess Bride, our audiobooks and teleplays of The Lord of the Rings, or, if we’re going for sentimentality, my copy of Steven Kellogg’s Best Friends was given to me by my aunt, who met Mr. Kellogg and got it signed for me. Ponies and puppies and best friends. I mean, what more could a kindergartener ask for? I love everything about this post!! Might have to try to copy if I can find the time. I wish that this would be a US trend too. Since the publisher was in the UK, they added it to the end.